Confucius once remarked that all students have but two greatest fears in their life. One is the process of taking exams (and the few days behind it, or months, depending on when you choose to start panicking) and the other being the day when the results are released. Okay, I created that up, but I'm sure Confucius would say something like that if he had to sit for the numerous exams we have like O-Levels/SPM, A-Levels/STPM, PSLE/UPSR and the countless small exams in between. 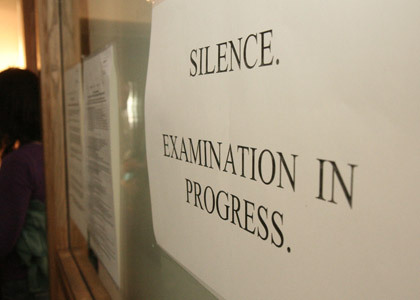 Heck, even those guys in ancient China had to take only one exam and they would be done with it. Sure the exam spans three days and you're not allowed to leave, but I would rather take it one shot rather than have it spread out all my entire life. As for me, tomorrow will be the third time in this university where I will have to face the second fear that Confucius was talking about. The process of knowing your results. And despite my numerous bad experiences of getting exam results, my stomach still twist into knots every time I know my results are coming out. Perhaps for me, the getting my exam grades are very much like the lottery results. You see, I'm one of the students who happens to have results fluctuating all the time. Which means that I'm not in the genius Albert Einstein group who undoubtedly have As plastered all over their results 110% of the time or the Ah Beng group who loves eggs very much. And most of the time, my efforts rarely translates into results. I could work like dog for one subject, expect to score at least a decent grade but end up with a big F on my paper and I could slack and do nothing but still end up with a grade that even astonishes myself. Which is why I say my exam results are like the lottery, because most of the time I will never know what I get until the actual date itself. My SPM and STPM results, for example, was like striking the 1 million dollar jackpot because i never expected such a good result. Most of the time however, I will end up with something worse than I thought I would get, sadly. This is especially more so after I came to university. The fact that people here actually spend their nights in library to study does not help a guy like me who prefers saving humanity from a computer. If this trend continues, I could foresee me packing up my bags and having to leave university already. But like it or not, I would have to still face tomorrow no matter how much I would want to just ignore it and brush it aside. I would choose to hide inside a cave if I can, but there are no caves in Singapore so that wouldn't be a very good idea too. And if it's any relief, almost all of the friends I know are also in the same state as me, with stomach going into knots too. Worrying too much won't change anything too. So I guess I'll just have to take it easy and slowly when tomorrow comes. 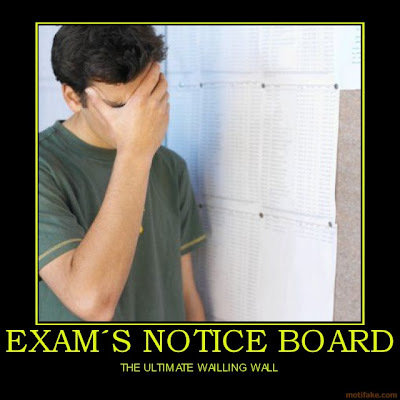 It's not the end of the world and it's just an exam results release date out of the so many millions I've been through. And like Confucius said, if you want to avoid the uncertainty of your exam results, you can always choose to study harder and make it into the geniuses gang or you could just give up and slip into the Ah Beng gang. Either way, it's much better than not knowing whether you will strike 4D, I mean 4As tomorrow. Now if you would excuse me, there's a cave I need to find.